When you need to replace teeth, you’ve got three options: a bridge, dentures (partial or full), or implants. Bridges look great and work well, but they’re not exactly ideal. Most types require the dentist to cut down perfectly healthy teeth on either side of the gap to be bridged so the prosthetic can be attached. Dentures are a better option: aesthetic, functional, and reasonably priced. And with the lightweight, thermodynamic materials available today, even one-tooth partials or “pop-ins” are a possibility. But there’s no bond between the denture and gums, which can cause problems like slippage or constantly trapped food. And if it doesn’t fit right, it can cause discomfort and even make it hard to speak normally. Additionally, with full dentures, you can expect bone loss over time, which affects the appearance of your lower face and mouth. By far, implants are your best option. They look and work just like natural teeth. They integrate with your jawbone. But not all implants are created equal. In fact, recent research has begun to highlight the problems with titanium implants in particular. Currently, titanium is the norm for implants, largely because the metal has been considered stable, durable, and nonreactive. This is turning out not to be the case. For one, they’re seldom made only with titanium. Other metals such as nickel and aluminum may be used – metals that are both highly toxic and prone to cause galvanic currents in the mouth when other metal restorations are present. Allergic reactions are also a possibility. Other research has suggested that titanium itself “can induce toxicity” or allergic responses, especially in patients who already have sensitivity to metals. Another issue is the fact that the metal itself can corrode, releasing metals into the body. This corrosion may be caused by bacteria around the implant, as well as exposure to substances such as fluoride and hydrogen peroxide. That there may be harmful bacteria around an implant is no surprise, really. Most extractions happen due to infection, usually gum disease. If that infection isn’t controlled or if the bone at the extraction site isn’t properly cleaned, it’s bound to proliferate once the gums have healed. Corrosion of the titanium simply aggravates inflammation around the implant, which can result in a condition known as “peri-implantitis.”. Only now are researchers beginning to understand just how big of a concern this is. Research recently presented at the California Dental Association’s CDA Presents 2017 meeting suggests the scope of the problem. However, about 10% of implants will have peri-implantitis after five to 10 years in 19% of patients, according to another systematic review and meta-analysis (Journal of Periodontology, November 2013, Vol. 84:11, pp. 1586-1598). Dr. [Mark] Reynolds discussed. Mucositis was found in 31% of implants and 63% of patients. Peri-implant mucositis indicates inflammation without the loss of bone you see with peri-implantitis. Often, that loss of bone means ultimate loss of the implant. 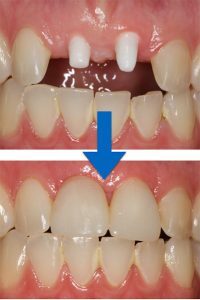 One of the first treatments a dentist might recommend for this condition is ultrasonic scaling – a very deep cleaning using a device that creates tiny bubbles that help disinfect areas below the gumline. According to research in Scientific Reports, this scaling may actually make the peri-implantitis worse. Because of such problems, we use only biocompatible ceramic (zirconium) implants. They’re entirely metal-free and less likely to encourage the kind of bacterial growth that leads to peri-implantits. Not only are they the safer option, they’re more aesthetic, too. In patients with thin or receding gums, the gray titanium can become visible. White ceramic retains a far more natural look. 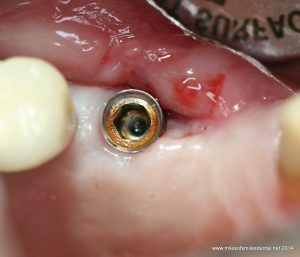 Are ceramic implants for everyone? Of course not. No treatment is. But when it comes to replacing teeth and retaining normal mouth functions, they certainly can’t be beat.